Uyuni is fairly easy to get to on a domestic flight from La Paz, however you canâ€™t just fly direct from Lima, Peru which was a little inconvenient for me and meant I had to stay overnight in La Paz. La Paz is a very interesting city and worth a visit, will write a bit more about the city at the end of this article! We flew with Amaszonas Airlines which only takes 45 minutes. 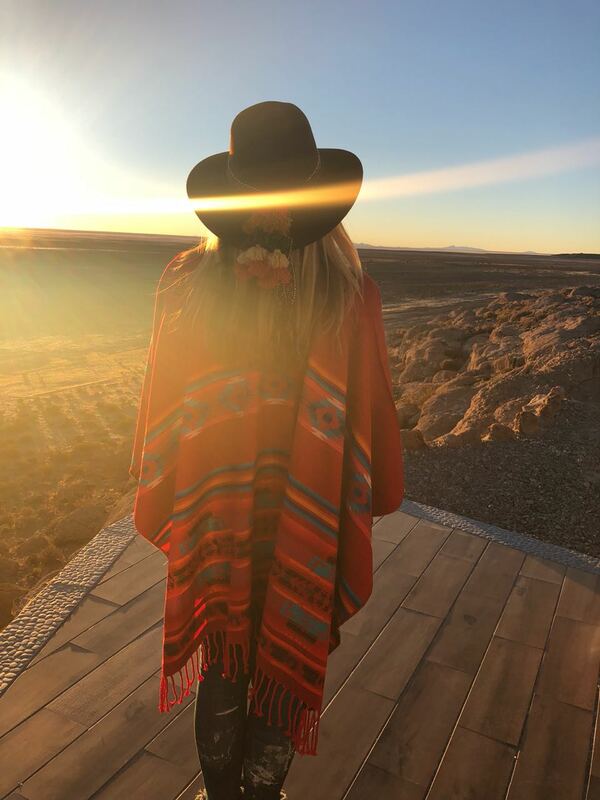 We found the best way to see everything Uyuni Salt Flats have to offer is to use a tour agency to be able to get a knowledgeable guide/driver and it is definitely worth paying the extra money to have a private tour. We said yes to not sharing a vehicle and beautiful hotels however it is possible to do this on a budget approach if you are happy to forgo some luxuries. We used Andes Salt Expeditions and chose the superior package option which included one night stay in the Luna Salada Hotel which is a luxury hotel made of salt. It has a lovely viewing platform outside and the rooms are modern and have panoramic windows. Train cemetery - you have time to wander around the derelict trains which look interesting against the salt flat background. Playa Blanca hotel (salt cafe) with the Dakar Rally flags and monument nearby. This is where you stop for lunch in a building made of salt. All the Dakar Rally flags look great against the salt flat background. Incawasi Island ( Inca House Island) - this is a must do. The giant cactus are just so unusual and you can walk around the island with lots of view stations across the salt flats. The Salt Flats - here you can do lots of fun photos playing with perspective and if you are there when there has been rain, you can photograph the mirror effect of salt/sky! It really is great fun! Luna Salada Hotel (made of salt) - we stayed at this hotel made of salt which was quite beautiful inside, with large modern rooms and lots of communal spaces to sit by the fire or have a drink. Great options for dinner and a good viewing platform outside to see the sunset across the salt flats. Laguna Hedionda to see three different species of flamingo. We opted to eat lunch here and have some free time to wander alongside the lake to watch the birds. Definitely recommend a visit. Laguna Colorada Red lake with flamingoes. We arrived here late in the day so there was not enough sunshine to make the red colours more visible. This is part and parcel of traveling though sometimes you just do not arrive at the right time of day to get best view or pictures! Laguna Verde is a very beautiful green lake and possibly my favorite along with Laguna Hedionda. La Paz is definitely worth a visit due to its quirkiness. We arrived to see people burning small fires on the pavement and found out they were burning llama foetus for the Pacha Mamaâ€¦totally bizarre to us but a ritual that was expected to bring good luck! We stayed in La Casona HoteL Boutique which is five minutes from the Witches Market and bazaaars. Spent an afternoon wandering all the street markets buying presents its fun and interesting and there are two Irish and an English bar to drop in en route. I would also recommend getting on the cable car as La Paz is interesting to view from above, it is a large city and this is an easy way to get across it. We enjoyed just wandering into the Jaen Street area and coming across interesting things such as a wedding. We were lucky enough to walk past a church when all the people were coming out dressed in their best clothes and we were just so fascinated by the hats the ladies were wearing. La Paz is a very lively city I promise you will not get bored! Hope some of these tips and ideas are useful to you and you have an amazing Uyuni trip if you decide to go! Check out Bolivia Hop for ideas and how to get around Bolivia on the cheap!